A note from the editors: We’re pleased to share an excerpt from Chapter 5 of Donna Lichaw ’s new book, The User’s Journey: Storymapping Products That People Love , available now from Rosenfeld Media. Both analytics funnels and stories describe a series of steps that users take over the course of a set period of time. In fact, as many data scientists and product people will tell you, data tells a story, and it’s our job to look at data within a narrative structure to piece together, extrapolate, troubleshoot, and optimize that story. 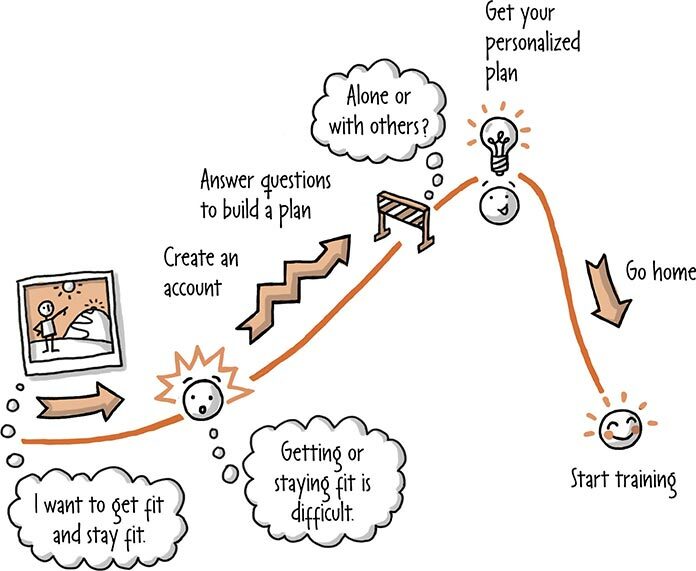 Exposition: The potential user is interested in getting fit or training others. Inciting Incident: She sees the “start training” button and gets started. Crisis: This is where the cliffhanger happens. She’s asked to “follow” friends. She has to enter sensitive Gmail or Facebook log-in credentials to do this, which she doesn’t like to do unless she completely trusts the product or service and sees value in following her friends. Why would she follow them in this case? To see how they’re training? She’s not sure she totally understands what she’s getting into, and at this point, has spent so much brain energy on this step that she’s just going to bail on this sign-up flow. Climax/Resolution: If she does continue on to the next step, there would be no climax. Falling Action: Eh. There is no takeaway or value to having gotten this far. End: If she does complete the sign-up flow, she ends up home. She’d be able to search for videos now or browse what’s new and popular. Searching and browsing is a lot of work for someone who can’t even remember why they’re there in the first place. Hmmm…in reality, if she got this far, maybe she would click on something and interact with the product. The data told us that this was unlikely. In the end, she didn’t meet her goal of getting fit, and the business doesn’t meet its goal of engaging a new user. Why was it so important for FitCounter to get people to complete this flow during their first session? Couldn’t the business employ the marketing team to get new users to come back later with a fancy email or promotion? In this case, marketing tried that. For months. It barely worked. With FitCounter, as with most products and services, the first session is your best and often only chance to engage new users. Once you grab them the first time and get them to see the value in using your product or service, it’s easier to get them to return in the future. While I anecdotally knew this to be true with consumer-facing products and services, I also saw it in our data. Those superfans I told you about earlier rarely became superfans without using the product within their first session. In fact, we found a sweet spot: most of our superfans performed at least three actions within their first session. These actions were things like watching or sharing videos, creating playlists, and adding videos to lists. These were high-quality interactions and didn’t include other things you might do on a website or app, such as search, browse, or generally click around. With all of our quantitative data in hand, we set out to fix our broken usage flow. It all, as you can imagine, started with some (more) data…oh, and a story. Of course. To acquire more “high-quality” users who were more likely to return and use the product over time. As you can see, getting people to pay to upgrade to premium wasn’t in our immediate strategic roadmap or plan. We needed to get this product operational and making sense before we could figure out how to monetize. We did, however, feel confident that our strategy was headed in the right direction because the stories we were designing and planning were ones that we extrapolated from actual paying customers who loved the product. We had also been testing our concept and origin stories and knew that we were on the right track, because when we weren’t, we maneuvered and adapted to get back on track. So what, in this case, did the data tell us that we should do to transform this story of use from a cliffhanger, with drop-off at the crisis moment, to a more complete and successful story? While our quantitative analytics told us a “what” (that people were dropping off during our sign-up funnel), it couldn’t tell us the “why.” To better answer that question, we used story structure to figure out why people might drop off when they dropped off. Doing so helped us better localize, diagnose, and troubleshoot the problem. Using narrative structure as our guide, we outlined a set of hypotheses that could explain why there was this cliffhanger. For example, if people dropped off when we asked them to find their friends, did people not want to trust a new service with their login credentials? Or did they not want to add their friends? Was training not social? We thought it was. To figure this out better, once we had a better idea of what our questions were, we talked to existing and potential customers first about our sign-up flow and then about how they trained (for example, alone or with others). We were pretty sure training was social, so we just needed to figure out why this step was a hurdle. What we found with our sign-up flow was similar to what we expected. Potential users didn’t want to follow friends because of trust, but more so because it broke their mental model of how they could use this product. “Start training” was a strong call to action that resonated with potential users. In contrast, “follow friends,” was not. Even something as seemingly minute as microcopy has to fit a user’s mental model of what the narrative structure is. Furthermore, they didn’t always think of training as social. There were a plethora of factors that played into whether or not they trained alone or with others. Goals (planning to run a 5k versus looking to lose pounds, for example). This was too complex of a math equation for potential users to do when thinking about whether or not they wanted to “follow” people. Frankly, it was more math than anyone should have to do when signing up for something. That said, after our customer interviews, we were convinced of the value of keeping the product social and giving people the opportunity to train with others early on. Yes, the business wanted new users to invite their friends so that the product could acquire new users. And, yes, I could have convinced the business to remove this step in the sign-up process so that we could remove the crisis and more successfully convert new users. However, when people behave in a certain way 50% of the time, you typically want to build a product that helps them continue to behave that way, especially if it can help the business grow its user base. So instead of removing this troublesome cliffhanger-inducing step in the sign-up flow, we did what any good filmmaker or screenwriter would do: we used that crisis to our advantage and built a story with tension and conflict. A story that we hoped would be more compelling than what we had. In order to determine how our new sign-up flow would work, we first mapped it out onto a narrative arc. Our lead designer and engineer wanted to jump straight into screen UI sketches and flow charts and our CEO wanted to see a fully clickable prototype yesterday, but we started the way I always make teams and students start: with a story diagram. As a team, we mapped out a redesigned sign-up flow on a whiteboard as a hypothesis, brick by brick (see Figure 5.20). Fig. 5.20 A story map from a similar project with the storyline on top and requirements below. This was the story, we posited, that a new user and potential customer should have during her first session with our product (see Figure 5.21). As you can see, we tried to keep it much the same as before so that we could localize and troubleshoot what parts were or weren’t working. Build a training plan. Instead of “following” topics, she answers a series of questions so that the system can build her a customized training plan. Many questions—ultimately extending the on-boarding flow by 15 screens. 15! There is a method to this madness. Even though there are now many more questions, they get more engaging, and more relevant, question by question, screen by screen. The questions start broad and get more focused as they progress, feeling more and more relevant and personal. Designing the questionnaire for rising action prevents what could be two crises: boredom and lack of value. Crisis: One of the last questions she answers is whether or not she wants to use this training plan to train with or help train anyone else. If so, she can add them to the plan right then and there. And if not, no problem—she can skip this step and always add people later. Climax/Resolution: She gets a personalized training plan. This is also the point at which we want her to experience the value of her new training plan. She sees a graph of what her progress will look like if she sticks with the training plan she just got. End: She’s home. Now she can start training. This initially involves watching a video, doing a quick exercise, and logging the results. She gets a taste of what it’s like to be asked to do something, to do it, and to get feedback in the on-boarding flow and now she can do it with her body and not just a click of the mouse. Instead of saying how many sit-ups she can do by answering a questionnaire, she watches a short video that shows her how to best do sit-ups, she does the exercise, and she logs her results. While humanly impossible to fully meet her goal of getting fit in one session, completing the story with this ending gets her that much closer to feeling like she will eventually meet her goal. Our hope was that this ending would function as a teaser for her next story with the product, when she continued to train. We wanted this story to be part of a string of stories, also known as a serial story, which continued and got better over time. 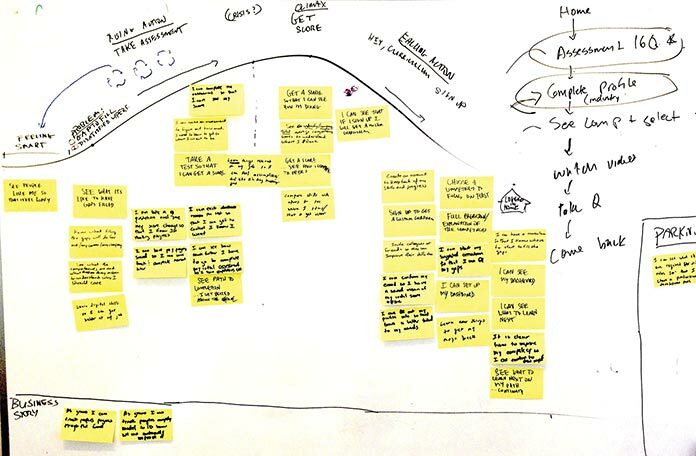 Once we plotted out this usage story, we ran a series of planning sessions to brainstorm and prioritize requirements, as well as plan a strategic roadmap and project plan. After we had our requirements fleshed out, we then sketched out screens, comics, storyboards, and even role-played the flow internally and in person with potential customers. We did those activities to ideate, prototype, and test everything every step of the way so that we could minimize our risk and know if and when we were on the right path. We were quite proud of our newly crafted narrative sign-up flow. But before we could celebrate, we had to see how it performed. Once we heard that from the third, fourth, and then fifth person during our in-person tests, we started to feel like we had an MVP that we were not only learning from, but also learning good things from. During our concept-testing phase, it seemed like we had a product that people might want to use. Our origin story phase and subsequent testing told us that the data supported that story. And now, with a usage story, we actually had a product that people not only could use, but wanted to use. Lots. Fig. 5.21 The story of what we wanted new users to experience in their first session with FitCounter. As planned, that reaction came during our in-person tests, unprompted, near the end of the flow, right after people received their training plan. What we didn’t expect was that once people got the plan and went to their new home screen, they started to tap and click around. A lot. And they kept commenting on how they were surprised to learn something new. And they would not only watch videos, but then do things with them, like share them or add and remove them from plans. But this was all in person. What about when we launched the new sign-up flow and accompanying product. This new thing that existed behind the front door. The redesign we all dreaded to do, but that had to be done. I wish I could say that something went wrong. This would be a great time to insert a crisis moment into this story to keep you on the edge of your seat. But the relaunch was a success. The story resonated not just with our in-person testers, but also with a broader audience. So much so that the new sign-up flow now had almost double the completion rate of new users. This was amazing, and it was a number that we could and would improve on with further iterations down the line. Plus, we almost doubled our rate of new user engagement. We hoped that by creating a sign-up flow that functioned like a story, the result would be more engagement among new users, and it worked. We not only had a product that helped users meet their goals, but it also helped the business meet its goals of engaging new users. What we didn’t expect to happen so soon was the side effect of this increased, high-quality engagement: these new users were more likely to pay to use the product. Ten times more likely. We were ecstatic with the results. For now. A business cannot survive on first-time use and engagement alone. While we were proud of the product we built and the results it was getting, this was just one usage story: the first-time usage story. What about the rest? What might be the next inciting incident to kick off a new story? What would be the next beginning, middle, and end? Then what? What if someone did not return? Cliffhangers can happen during a flow that lasts a few minutes or over a period of days, months, or years. Over time, we developed stories big and small, one-offs and serials, improving the story for both customers and the business. Since we started building story-first, FitCounter has tripled in size and tripled its valuation. It is now a profitable business and recently closed yet another successful round of financing so that it can continue this growth. Great article Donna. Thanks for sharing your knowledge with the community. A really nice insight into product design and user flow. I will bring some of these pro-tips into the current project i am working on. Thanks @Piastre per capelli. And @Freelance Web Developer UK, that’s great to hear. I love to see how people apply this thinking to their projects, so if you ever have samples or photos, send them my way! Really enjoyed reading this Donna. Well thought out and from a business point of view, some great advice. Thank you. Thanks for the article! I have some doubts about the story map but your example is very useful for realize the importance of this tool. User Journey Guide. How to Think in User Flows Instead of Standalone Screens.